If your child was abusing drugs, would you know the signs? If you or a loved one is battling addiction, do you know what resources are available in this community that could help? 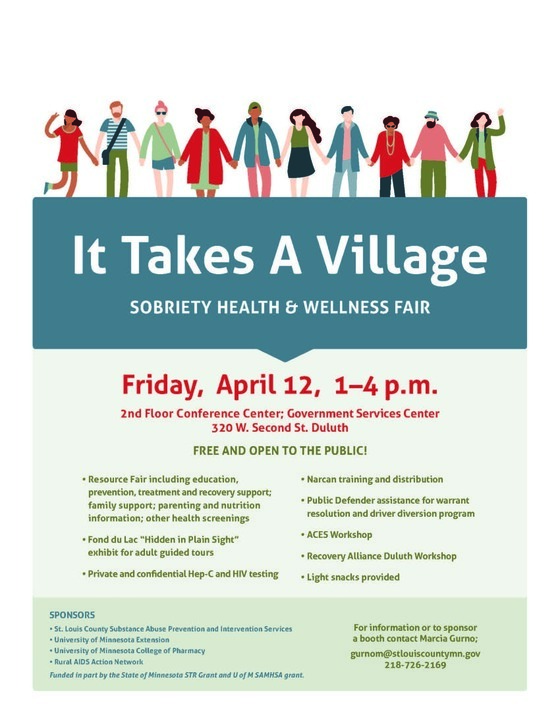 St. Louis County Public Health and Human Services is hosting a sobriety health and wellness fair on Friday, April 12, from 1 to 4 p.m. in the Government Services Center, 320 W. 2nd Street. The event is free and open to the public. The resource fair will include a variety of community agencies offering education, prevention, treatment and recovery support; plus family support; and parenting and nutrition information. The Fond du Lac Band will provided guided adult tours of its Hidden in Plain Sight exhibit, which is a model of a bedroom showing items that often indicate drug use. A variety of health screenings will be offered, plus private and confidential Hep-C and HIV testing. Training in how to administer Narcan, plus free kits, will also be provided. The Public Defender's Office will have staff on hand to assist with any outstanding warrants statewide and with the driver diversion program. Additionally, there will be two workshops offered: one on Acute Childhood Experiences (ACEs) and the other by Recovery Alliance Duluth. The sobriety health and wellness fair is sponsored by St. Louis County Substance Abuse Prevention and Intervention Services, University of Minnesota Extension, University of Minnesota College of Pharmacy, and the Rural Aids Action Network. Additional funding is provided by the State of Minnesota STR Grant and U of M SAMHSA Grant.